Many Americans have been politically active on social media, from encouraging others to take action to using issue-related hashtags. And liberal Democrats were more likely than other ideological and partisan groups to have engaged in these activities, according to a new Pew Research Center analysis of survey data collected this summer. 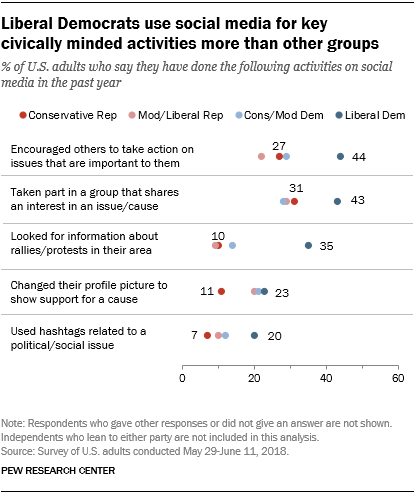 Liberal Democrats are especially likely to use social media to mobilize others or find like-minded groups. Some 44% of liberal Democrats say they have used these sites in the past year to encourage others to take action on an issue that was important to them, while a similar share (43%) have taken part in a group that shares their interest in a cause, according to a survey of U.S. adults conducted May 29-June 11, 2018. These shares fall to around a third or fewer among conservative or moderate Democrats and among conservative, moderate or liberal Republicans. At the time of the survey, liberal Democrats also stood out for recently looking up information about local rallies or protests on social media or using hashtags related to a political or social issue. (A separate survey conducted by the Center this summer found that liberal Democrats were far more likely than other ideological groups to report attending a political rally or event in the past year.) However, similar shares of liberal Democrats, conservative or moderate Democrats and liberal Republicans say they have changed their profile picture to show support for a cause within the past year. Overall, two-thirds of liberal Democrats reported doing at least one of these five activities in the past year – compared with half or less of conservative or moderate Democrats (52%), moderate or liberal Republicans (48%) or conservative Republicans (44%). These differences are present among younger but not older groups. For example, 74% of liberal Democrats ages 18 to 49 have engaged in one or more of these activities. That is double the share of conservative Republicans in the same age range (37%). But among those 50 and older, similar shares of liberal Democrats and conservative Republicans use social media in this way (55% vs. 48%). Beyond age, there are other factors – such as educational attainment or race and ethnicity – that may influence whether Americans are politically active on social media. And it is worth noting that while majorities of Republicans and Democrats use social media in one form or another, Democrats are more likely to use multiple platforms. 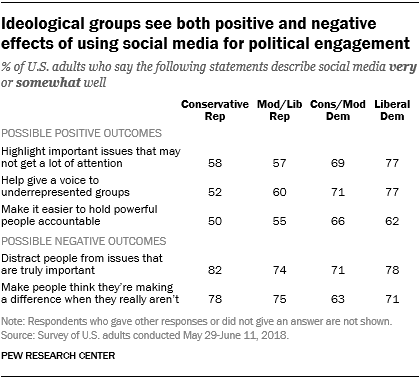 There are also notable partisan differences when Americans were asked how important social media is to them personally as a venue for their own political engagement. Democrats who use social media are more likely than Republicans to say these sites are important for allowing them to find others who share their views (50% vs. 39%), getting involved with issues that are important to them (49% vs. 34%) or giving them a space to share their political views (43% vs. 33%). One of the debates surrounding activism on social media is whether these platforms help spearhead change or if these actions have little to no impact on the political environment. 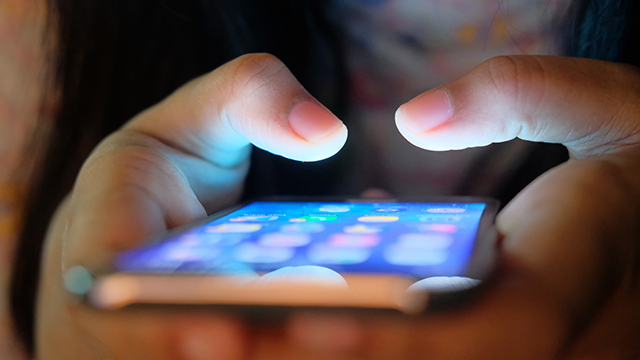 The Center’s survey findings from this summer show that ideological differences extend to some attitudes about social media’s effectiveness in achieving political goals, as well as its broader impact on society. But these differences are more pronounced in some areas than in others. For example, close to nine-in-ten liberal Democrats (86%) believe these platforms are very or somewhat important for creating sustained social movements, compared with around seven-in-ten conservative or moderate Democrats (73%) and just over half of liberal or moderate Republicans (56%) and conservative Republicans (53%). Partisans’ views are more closely aligned when they are asked about the importance of these platforms for getting elected officials to pay attention to issues or influencing policy decisions. At the same time, Democrats are more likely than their Republican counterparts to say these platforms can have a positive impact. 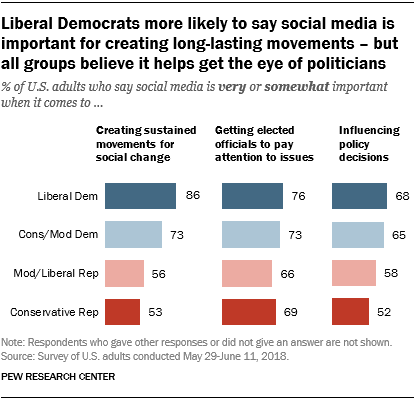 For example, 77% of liberal Democrats say the statement “social media helps give a voice to underrepresented groups” describes these sites at least somewhat well, compared with 52% of conservative Republicans. A similar pattern exists for sentiments about social media’s ability to highlight important issues that may not get a lot of attention otherwise or make it easier to hold powerful people accountable. But there are fewer ideological differences when it comes to some of the potentially negative outcomes of political engagement on social media. Majorities in each of these groups feel that social media can distract people from more important issues or that these platforms make people think they are making a difference when they really are not. Jingjing Jiang is a former research analyst focusing on internet and technology at Pew Research Center.